Neutropenia is a decrease in circulating neutrophils in the nonmarginal pool, which constitutes 4-5% of total body neutrophil stores. Most of the neutrophils are contained in the bone marrow, either as mitotically active (one third) or postmitotic mature cells (two thirds). Granulocytopenia is defined as a reduced number of blood granulocytes, namely neutrophils, eosinophils, and basophils. However, the term granulocytopenia is often used synonymously with neutropenia and, in that sense, is again confined to the neutrophil lineage alone. The risk of serious infection increases as the absolute neutrophil count (ANC) falls to the severely neutropenic range (< 500/µL). The duration and severity of neutropenia directly correlate with the total incidence of all infections and of those infections that are life threatening. Tuberculosis (see the image below) is one type of infection that may cause neutropenia. 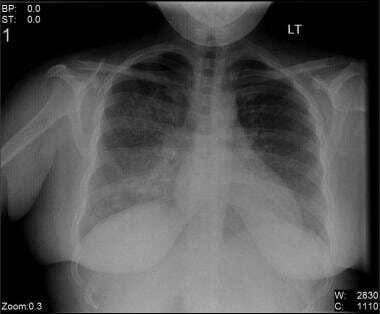 Anteroposterior chest radiograph in a young ED patient presenting with cough and malaise. The radiograph shows a classic posterior segment right upper lobe density consistent with active tuberculosis. This woman was admitted to isolation and started empirically on a 4-drug regimen in the ED. Tuberculosis was confirmed on sputum testing. Image courtesy of Remote Medicine, remotemedicine.org. Concurrent anemia, thrombocytopenia, and/or an abnormal result on a peripheral blood smear from a patient with neutropenia suggest an underlying hematologic disorder. In this setting, immediately perform a bone marrow aspiration and obtain a biopsy from the posterior iliac crest. Cytogenetic analysis and cell-flow analysis of the aspirate may be indicated. Neutropenia is a decrease in circulating neutrophils in the nonmarginal pool, which constitutes 4-5% of total body neutrophil stores. Most of the neutrophils are contained in the bone marrow, either as mitotically active (one third) or postmitotic mature cells (two thirds). [2, 12] Granulocytopenia is defined as a reduced number of blood granulocytes, namely neutrophils, eosinophils, and basophils. However, the term granulocytopenia is often used synonymously with neutropenia and, in that sense, is again confined to the neutrophil lineage alone. Neutropenia is defined in terms of the absolute neutrophil count (ANC). The ANC is calculated by multiplying the total white blood cell (WBC) count by the percentage of neutrophils (segmented neutrophils or granulocytes) plus the band forms of neutrophils in the complete blood count (CBC) differential. See the Absolute Neutrophil Count calculator. Note that many modern automated instruments actually calculate and provide the ANC number in their reports. These instruments do not analyze separately bands from segmented neutrophils, and so the combined number is termed the absolute neutrophil count (ANC), representing both bands and more mature segmented neutrophils. If a band number is reported separately, usually by smear review, then one can divide the ANC into bands and segmented neutrophils by subtracting the absolute band number from the total ANC. The lower limit of the reference value for ANC in adults varies in different laboratories from 1.5-1.8 109/L or 1500-1800/µL (mm3). For practical purposes, a value lower than 1500 cells/µL is generally used to define neutropenia. Age, race, genetic background, environment, and other factors can influence the neutrophil count. For example, blacks may have a lower but normal ANC value of 1000 cells/µL, with a normal total WBC count. Neutropenia is classified as mild, moderate, or severe, based on the ANC. Mild neutropenia is present when the ANC is 1000-1500 cells/µL, moderate neutropenia is present with an ANC of 500-1000/µL, and severe neutropenia refers to an ANC lower than 500 cells/µL. The risk of bacterial infection is related to both the severity and duration of the neutropenia. The term agranulocytosis is used to describe a more severe subset of neutropenia. Agranulocytosis refers to a virtual absence of neutrophils in peripheral blood. It is usually applied to cases in which the ANC is lower than 100/μL. [12, 13, 14, 15] The reduced number of neutrophils makes patients extremely vulnerable to infection. [12, 16] Cardinal symptoms include fever, sepsis, and other manifestations of infection. Causes can include drugs, chemicals, infective agents, ionizing radiation, immune mechanisms, primary bone marrow failure syndromes, and heritable genetic aberrations. Some cases, such those from benign familial neutropenia, are characterized by only mild neutropenia and are of no obvious significance for health. This article is limited to discussing neutropenia (ANC < 1500/µL) and agranulocytosis (ANC < 100/µL). It does not address the transient neutropenia associated with cancer chemotherapy, nor does it consider agranulocytosis occurring as part of primary marrow-failure syndromes (eg, aplastic anemia, pancytopenia, acute leukemia, myelodysplastic syndromes). For more information, see the Medscape article Pediatric Autoimmune and Chronic Benign Neutropenia. Mature neutrophils are produced by precursors in the bone marrow. The total body neutrophil content can be divided conceptually into the following three compartments: the bone marrow, the blood, and the tissues. In the marrow, the neutrophils exist in two divisions: the proliferative, or mitotic, compartment (myeloblasts, promyelocytes, myelocytes) and the maturation-storage compartment (metamyelocytes, bands, mature neutrophils, polymorphonuclear leukocytes ["polys"]). Neutrophils leave the marrow storage compartment and enter the blood without reentry into the marrow. In the blood, two compartments are also present, the marginal compartment and the circulating compartment. Some neutrophils do not circulate freely (marginal compartment), but are adherent to the vascular surface, and these constitute approximately half of the total neutrophils in the blood compartment. Neutrophils leave the blood pool in a random manner after 6-8 hours and enter the tissues, where they are destined for cellular action or death. Thus, if the process producing neutropenia is unknown, measurements of the blood neutrophil number, ANC, must often be supplemented by bone marrow examination to determine whether adequate production of neutrophils or increased destruction of neutrophils exists. Sites and mechanisms that cause neutropenia can be restricted to any of the three compartments or their subcomponents: bone marrow (mitotic or mature storage pools); blood (circulating and marginal pools); or tissues (sequestration). For example, benign congenital neutropenias are associated with a decrease in only the pool of circulating neutrophils; affected individuals have entirely normal marrow pools, marginal blood pools, and tissue neutrophils. Disorders of the pluripotent myeloid stem cells and committed myeloid progenitor cells, which cause decreased neutrophil production, include some congenital forms of neutropenia, aplastic anemia, acute leukemia, and myelodysplastic syndromes. Other examples include bone marrow tumor infiltration, radiation, infection (especially viral), and bone marrow fibrosis. Cancer chemotherapy, other drugs, and toxins may damage hematopoietic precursors by directly affecting bone marrow. The clinical sequelae of neutropenia usually manifests as infections, most commonly of the mucous membranes. Skin is the second most common infection site, manifesting as ulcers, abscesses, rashes, and delays in wound healing. The genitalia and perirectum are also affected. However, the usual clinical signs of infection, including local warmth and swelling, may be absent, as these require the presence of significant numbers of neutrophils. Fever, however, is often present, and its presence requires urgent attention in the setting of severe neutropenia. The risk of serious infection increases as the ANC falls to the severely neutropenic range (< 500/µL). The duration and severity of neutropenia directly correlate with the total incidence of all infections and those infections that are life threatening. When the ANC is persistently lower than 100 cells/µL for longer than 3-4 weeks, the incidence of infection approaches 100%. In prolonged severe neutropenia, life-threatening gastrointestinal and pulmonary infections occur, as does sepsis. However, patients with neutropenia are not at increased risk for parasitic and viral infections, as these are defended by innate and lymphocyte-mediated immune mechanisms. Bacterial organisms most often cause fever and infection in neutropenic patients. Fungal organisms are also significant pathogens in the setting of neutropenia. Historically, gram-negative aerobic bacteria (eg, Escherichia coli, Klebsiella species, Pseudomonas aeruginosa) have been most common in these patients. However, gram-positive cocci, especially Staphylococcus species and Streptococcus viridans, have emerged as the most common pathogens in fever and sepsis because of the increasing use of indwelling right atrial catheters. After neutropenic patients receive treatment with broad-spectrum antibiotics for several days, superinfection with fungi is common. Candida species are the most frequently encountered organisms in this setting. The list for all the potential causes of neutropenia is not short. The etiology of neutropenia can conceptually be viewed in two broad ways, by mechanism or etiologic category. The mechanisms that cause neutropenia are varied and not completely understood. In many cases, neutropenia occurs after prolonged exposure to a drug or other substance, resulting in decreased neutrophil production by hypoplastic bone marrow. This suggests a direct stem cell toxic effect. In other cases, repeated but intermittent drug or other exposure is needed. This suggests an immune mechanism, although this idea has not been proven. In many clinical situations, the exact exposure and its duration in relation to the onset of neutropenia are not known. In view of this incomplete understanding of the mechanisms for neutropenia, classification by broad etiologic category is simpler to retain. In this schema, the etiology of neutropenia can be classified as either congenital (hereditary) or acquired. Though this categorization may have limited clinical diagnostic utility, it can be useful to clearly separate hereditary causes of neutropenia from the panoply of acquired causes. In the setting of hereditary neutropenias, these disorders can be further described as associated with isolated neutropenia or with other defects, whether immune or phenotypic. Many hereditary disorders are due to mutations in the gene encoding neutrophil elastase, ELA2. Several alleles are involved. The most common mutations are intronic substitutions that inactivate a splice site in intron 4. Genes other than ELA2 are also involved. The Table below lists some of the genetic conditions involved; these are uncommon conditions. AML = acute myeloid leukemia; G-CSF = granulocyte colony-stimulating factor; MDS = myelodysplastic syndrome. Causes of acquired neutropenia are complex, but most are related to three major categories: infection, drugs (both direct toxic or immune mediated), and autoimmune. Chronic benign neutropenia, or chronic idiopathic neutropenia, appears to be an overlap disorder with hereditary and acquired forms, and is sometimes indistinguishable. Some neutropenic patients give a clear history and familial pattern, whereas others have no familial history, few blood test determinations, and an unknown duration of neutropenia. This group of patients could have hereditary or acquired neutropenia. A brief summary of both congenital and acquired neutropenic disorders follows. Neutropenia with abnormal immunoglobulins is observed in individuals with X-linked agammaglobulinemia, isolated immunoglobulin A (IgA) deficiency, X-linked hyperimmunoglobulin M (XHIGM) syndrome, and dysgammaglobulinemia type I. In XHIGM, which is due to mutations in the CD40 ligand, patients can actually have normal or elevated levels of IgM but markedly decreased serum IgG levels. In all these disorders, the infection risk is high, and the treatment is intravenous immunoglobulin (IVIG). Patients with reticular dysgenesis demonstrate severe neutropenia, no cell-mediated immunity, agammaglobulinemia, and lymphopenia. Life-threatening infections occur that are refractory to granulocyte colony-stimulating factor (G-CSF). [22, 23, 24] Bone marrow transplantation is the treatment of choice. Severe congenital neutropenia (SCN), or Kostmann syndrome, is most often caused by a recessive inheritance and found in remote, isolated populations with a high degree of consanguinity. Autosomal dominant and sporadic cases have also been reported, most often due to mutations in the G-CSF receptor. No uniform genetic defect exists in this syndrome. Mutations in ELA2, which are causative for cyclic neutropenia (see below) are not sufficient to explain the phenotype of Kostmann-like SCN. Patients present by age 3 months with recurrent bacterial infections. The mouth and perirectum are the most common sites of infection. This type of neutropenia is severe, and the treatment is G-CSF. Risk of conversion to myelodysplastic syndrome (MDS)/acute myelogenous leukemia (AML) with monosomy 7 after G-CSF treatments is associated with additional acquired mutations. Most of these cases are caused by a mutation in the G-CSF receptor. Patients whose condition responds clinically to G-CSF are treated for life. Some patients with other forms of SCN appear to have mutations in GFI1, a zinc-finger transcriptional repressor gene involved in hematopoietic stem cell function and lineage commitment decisions. Cyclic neutropenia (CN) is characterized by periodic bouts of neutropenia associated with infection, followed by peripheral neutrophil count recovery. Its periodicity is about 21 days (range, 12-35 d). Granulocyte precursors disappear from the marrow before each neutrophil nadir in the cycle because of accelerated apoptosis of myeloid progenitor cells. Some cases may be genetically determined with an autosomal recessive inheritance. Other cases may be due to an autosomal dominant inheritance. In some sporadic cases of CN, patients have mutations in ELA2. People with CN typically present as infants or children, but acquired forms of CN in adulthood exist. The prognosis is good, with a benign course; however, 10% of patients will experience life-threatening infections. The treatment for cyclic neutropenia is daily G-CSF. Affected individuals with chronic benign neutropenia have an overall low risk of infection. Familial chronic benign neutropenia is a disorder with an autosomal dominant pattern of inheritance observed in western Europeans, Africans, and Jewish Yemenites. Patients are typically asymptomatic, and the infections are mild. No specific therapy is required. In nonfamilial chronic benign neutropenias, mild infections with a benign course typify this disorder. The ANC, however, does respond to stress, such as infection, corticosteroids, and catecholamines. Idiopathic chronic severe neutropenia is a diagnosis of exclusion. Affected patients exhibit infections and severe neutropenia. Shwachman syndrome (Shwachman-Diamond) has an autosomal recessive inheritance pattern. The neutropenia is moderate to severe, with a mortality rate of 15-25%, and the syndrome presents in infancy, with recurrent infections, diarrhea, and difficulty in feeding. Dwarfism, chondrodysplasia, and pancreatic exocrine insufficiency can occur. Shwachman-Diamond syndrome and X-linked dyskeratosis congenita (DC), cartilage-hair hypoplasia (CHH), and Diamond-Blackfan anemia (DBA) all appear to share common gene defects involved in ribosome synthesis. Most cases of Shwachman-Diamond syndrome are caused by mutations in the SBDS gene. The precise function of this gene is still being elucidated; however, it is involved in ribosome synthesis and RNA processing reactions. The treatment is G-CSF. In CHH, the inheritance pattern is autosomal recessive on chromosome 9, and it is observed in Amish and Finnish families. CHH is caused by mutations in the RMRP gene, which encodes the RNA component of the ribonuclease mitochondrial RNA processing (RNase MRP) complex. The neutropenia is moderate to severe. CHH presents with cell-mediated immunity defects, macrocytic anemia, gastrointestinal disease, and dwarfism. It also shows a predisposition to cancer, especially lymphoma. The treatment is bone marrow transplantation. Dyskeratosis congenita (Zinsser-Cole-Engman syndrome) presents with mental retardation, pancytopenia, and defective cell-mediated immunity. Dyskeratosis congenita is more common in men than in women and is hematologically similar to Fanconi anemia. 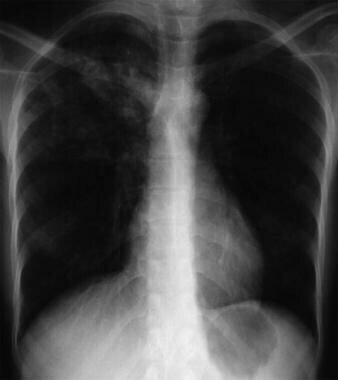 Dyskeratosis congenita is usually X-linked recessive, although autosomal dominant and autosomal recessive forms of this disorder exist. The X-linked recessive form of the disorder has been linked to mutations in DKC1, which encodes dyskerin, a nucleolar protein associated with ribonucleoprotein particles. The autosomal dominant form is associated with mutations in another gene, TERC, which is part of telomerase. Telomerase has both a protein and RNA component, and TERC codes the RNA component. Patients with this disorder have shorter telomeres than normal. The treatment is G-CSF, granulocyte-macrophage colony-stimulating factor (GM-CSF), and bone marrow transplantation. Barth syndrome is an X-linked recessive disorder presenting with cardiomyopathy in infancy, skeletal myopathy, recurrent infections, dwarfism, and moderate to severe neutropenia. Chediak-Higashi syndrome is an autosomal recessive disorder with recurrent infections, mental slowing, photophobia, nystagmus, oculocutaneous albinism, neuropathy, bleeding disorders, gingivitis, and lysosomal granules in various cells. The neutropenia is moderate to severe, and the treatment is bone marrow transplantation. Myelokathexis presents in infancy with moderate neutropenia and is associated with recurrent infections. The condition is due to accelerated apoptosis and decreased expression of bcl-x in neutrophil precursors. An abnormal nuclear appearance is observed, with hypersegmentation with nuclear strands, pyknosis, and cytoplasmic vacuolization. The treatment is G-CSF and GM-CSF. Lazy leukocyte syndrome is a severe neutropenia with associated abnormal neutrophil motility. The etiology is unknown, and the treatment is supportive in nature. These are chronic neutropenias with variable ANCs. They include glycogen storage disease type 1b and various acidemias, such as isovaleric, propionic, and methylmalonic. In glycogen storage disease type 1b, the treatment is G-CSF and GM-CSF. A drug may act as a hapten and induce antibody formation. This mechanism operates in cases due to gold, aminopyrine, and antithyroid drugs. The antibodies destroy the granulocytes and may not require the continued presence of the drug for their action. Alternatively, the drug may form immune complexes that attach to the neutrophils. This mechanism operates with quinidine. In isoimmune neonatal neutropenia, the mother produces IgG antineutrophil antibodies to fetal neutrophil antigens that are recognized as nonself. This occurs in 3% of live births. The disorder manifests as neonatal fever, urinary tract infection, cellulitis, pneumonia, and sepsis. The duration of the neutropenia is typically 7 weeks. Chronic autoimmune neutropenia is observed in adults and has no age predilection. As many as 36% of patients will exhibit serum antineutrophil antibodies, and the clinical course is usually less severe. Patients can have this disorder in association with systemic lupus erythematosus, rheumatoid arthritis, Wegener granulomatosis, and chronic hepatitis. If chronic autoimmune neutropenia is associated with these diseases, corticosteroids are indicated as treatment. In neonates and children, this disorder is associated with a lower risk of infection and milder infections involving the middle ear, gastrointestinal tract, and skin. T-gamma lymphocytosis, or lymphoproliferative disorder, is a clonal disease of CD3+ T lymphocytes or CD3- natural killer (NK) cells that infiltrate the bone marrow and tissues. Also known as leukemia of large granular lymphocytes (LGL-leukemia), T-gamma lymphocytosis can be associated with rheumatoid arthritis and is associated with high-titer antineutrophil antibodies. The neutropenia is persistent and severe. The treatment is often supportive in nature, but it is also directed at eliminating the clonal population. Bilateral interstitial infiltrates in a 31-year-old patient with influenza pneumonia. 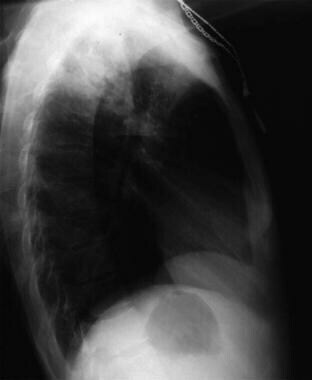 Lateral chest radiograph in a 31-year-old patient with influenza pneumonia. Image courtesy of Remote Medicine, remotemedicine.org. The most commonly involved organisms are from endogenous flora. Staphylococcus aureus organisms are found in cases of skin infections. Gram-negative organisms are observed in infections of the urinary and gastrointestinal tracts, particularly Escherichia coli and Pseudomonas species. Candida albicans infections may also occur. Mixed flora may be found in the oral cavity. Viral infections often lead to mild or moderate neutropenia. Agranulocytosis is uncommon but may occur. The most common organisms are Epstein-Barr virus, hepatitis B virus, yellow fever virus, cytomegalovirus, and influenza. Many overwhelming infections, both viral and bacterial, may cause severe neutropenia. Nutritional deficiencies that can cause neutropenia include vitamin B-12, folate, and copper deficiency. Numerous drugs have been associated with neutropenia. The highest risk categories are antithyroid medications, macrolides, and procainamides. As stated above, many drugs act by an immune-mediated mechanism. However, some drugs appear to have direct toxic effects on marrow stem cells or neutrophil precursors in the mitotic compartment. For example, drugs such as the antipsychotics and antidepressants and chloramphenicol may act as direct toxins in some individuals, based on metabolism and sensitivity in this manner. Other drugs may have a combination of immune and nonimmune mechanisms or may have unknown mechanisms of action. Analgesics and anti-inflammatory agents include aminopyrine, dipyrone, indomethacin, ibuprofen, acetylsalicylic acid, diflunisal, sulindac, tolmetin, benoxaprofen, barbiturates, mesalazine, and quinine. Antipsychotics, antidepressants, and neuropharmacologic agents include phenothiazines (chlorpromazine, methylpromazine, mepazine, promazine, thioridazine, prochlorperazine, trifluoperazine, trimeprazine), clozapine, risperidone, imipramine, desipramine, diazepam, chlordiazepoxide, amoxapine, meprobamate, thiothixene, and haloperidol. Anticonvulsants include valproic acid, phenytoin, trimethadione, mephenytoin (Mesantoin), ethosuximide, and carbamazepine. Antithyroid drugs include thiouracil, propylthiouracil, methimazole, carbimazole, potassium perchlorate, and thiocyanate. Cardiovascular drugs include procainamide, captopril, aprindine, propranolol, hydralazine, methyldopa, quinidine, diazoxide, nifedipine, propafenone, ticlopidine, and vesnarinone. Antihistamines include cimetidine, ranitidine, tripelennamine (Pyribenzamine), methaphenilene, thenalidine, brompheniramine, and mianserin. Diuretics include acetazolamide, bumetanide, chlorothiazide, hydrochlorothiazide, chlorthalidone, methazolamide, and spironolactone. Hypoglycemic agents include chlorpropamide and tolbutamide. Antimalarial drugs include amodiaquine, dapsone, hydroxychloroquine, pyrimethamine, and quinine. Miscellaneous drugs include allopurinol, colchicine, aminoglutethimide, famotidine, bezafibrate, flutamide, tamoxifen, penicillamine, retinoic acid, metoclopramide, phenindione, dinitrophenol, ethacrynic acid, dichlorodiphenyltrichloroethane (DDT), cinchophen, antimony, pyrithyldione, rauwolfia, ethanol, chlorpropamide, tolbutamide, thiazides, spironolactone, methazolamide, acetazolamide, IVIG, and levodopa. Heavy metals include gold, arsenic, and mercury. Exposure to drugs or chemicals is the most common cause of agranulocytosis: about one half of patients have a history of medication or chemical exposure. Any chemical or drug that can depress the bone marrow and cause hypoplasia or aplasia is capable of causing agranulocytosis. Some drugs do this to everyone if they are administered in large enough doses. Other agents seem to cause idiosyncratic reactions that affect only certain susceptible individuals. Some agents (eg, valproic acid, carbamazepine, and beta-lactam antibiotics) act by direct inhibition of myelopoiesis. In bone marrow cultures, these agents inhibit granulocyte colony formation in a dose-related fashion. Direct damage to the bone-marrow microenvironment or myeloid precursors plays a role in most other cases. Immunologic neutropenias may occur after bone marrow transplantation and blood product transfusions. Felty syndrome is a syndrome of rheumatoid arthritis, splenomegaly, and neutropenia. Splenectomy shows an initial response, but neutropenia may recur in 10-20% of patients. Treatment is directed toward rheumatoid arthritis. In complement activation–mediated neutropenia, hemodialysis, cardiopulmonary bypass, and extracorporeal membrane oxygenation (ECMO) expose blood to artificial membranes and can cause complement activation with subsequent neutropenia. In splenic sequestration, the degree of neutropenia resulting from this process is proportional to the severity of the splenomegaly and the bone marrow’s ability to compensate for the reduction in circulating bands and neutrophils. Go to Pediatric Autoimmune and Chronic Benign Neutropenia for complete information on this topic. The incidence of drug-induced neutropenia is one case per million persons per year.The exact frequency of agranulocytosis is unknown; the estimated frequency is 1.0-3.4 cases per million population per year. Age can influence the neutrophil count. Elderly individuals have a higher incidence rate of neutropenia than younger individuals. Agranulocytosis occurs in all age groups. The congenital forms are most common in childhood; acquired agranulocytosis is most common in the elderly population. Go to Pediatric Autoimmune and Chronic Benign Neutropenia for complete information on this topic. Neutropenia occurs more commonly in females than in males. Agranulocytosis occurs slightly more frequently in women than in men, possibly because of their increased rate of medication usage. Whether this higher frequency is related to the increased incidence of autoimmune disease in women is unknown. Race and genetic background can influence ANC. Blacks, Ethiopians, Yemenite Jews, and certain populations in the world could have lower ANCs due to lower WBC counts. Data from US National Health and Nutritional examination 1999 to 2004 survey found the prevalence of neutropenia to be 4.5% among black participants, 0.79% in white individuals, and 0.38% in Mexican-Americans. Blacks have a lower neutrophil count either due to defective granulocyte release from normal bone marrow, or they may have a compromised bone marrow reserve. Agranulocytosis has no racial predilection. The prognosis of a patient with neutropenia depends on the primary etiology, duration, and severity of the neutropenia. Improved broad-spectrum antibiotic agents, combined with improved supportive care, have improved the prognosis for most patients with severe neutropenia. Ultimately, patient survival depends on the recovery of adequate neutrophil numbers. Morbidity in those with neutropenia usually involves infections during severe, prolonged episodes of neutropenia. The infections may be superficial, involving mainly the oral mucosa, gums, skin, and sinuses, or they may be systemic, with life-threatening septicemia. If agranulocytosis is untreated, the risk of dying is high. Death results from uncontrolled sepsis. If the condition can be reversed with treatment, the risk of dying is low. Antibiotic and antifungal medications can cure the infection if the ANC rises. Agranulocytosis secondary to viral infections is usually self-limited, and patients with such conditions have a good prognosis. Drug-induced agranulocytosis carries a mortality rate of 6-10%. If treated promptly and vigorously, patients with drug-induced agranulocytosis have a good prognosis. Patients with neutropenia should be instructed to avoid exposure to people with respiratory tract infections. They should avoid overcrowded areas, and if their ANC is less than 1000/µL, they should wear a facemask in public places. Patients should be instructed to avoid any drug that was previously implicated in causing them neutropenia. They should be educated about the importance of frequent CBC testing in the initial period when a new drug with a high propensity to cause neutropenia is introduced. The exact frequency of testing depends on the specific drug and the time course of neutropenia association. At the first sign of a drop in the ANC, the drug should be discontinued. The Centers for Disease Control and Prevention offers patient education information on neutropenia and infection risk for cancer patients receiving chemotherapy and preventing infections during cancer therapy. In the workplace, people must be educated to follow regulations from the Occupational Safety and Health Administration (OSHA) that cover safety precautions when they deal with toxic substances. For patient education information, see the Blood and Lymphatic System Center and Immune System Center, as well as Anemia, Sepsis (Blood Infection), Leukemia, and Lymphoma. Jacobson CA, Berliner N. Neutropenia. Greer JP, Arber DA, Glader B, et al, eds. Wintrobe’s Clinical Hematology. 13th ed. Philadelphia, PA: Lippincott, Williams & Wilkins; 2014. 1279-89. Smith CW. Production, Distribution, and Fate of Neutrophils. Kaushansky K, Lichtman MA, Prchal JT, et al. Williams Hematology. 9th ed. New York, NY: McGraw-Hill; 2016. Schwarzinger M, Sagaon-Teyssier L, Cabaret O, Bretagne S, Cordonnier C, Pautas C, et al. Performance of serum biomarkers for the early detection of invasive aspergillosis in febrile, neutropenic patients: a multi-state model. PLoS One. 2013. 8(6):e65776. [Medline]. Bodey GP. Managing infections in the immunocompromised patient. Clin Infect Dis. 2005 Apr 1. 40 Suppl 4:S239. [Medline]. [Guideline] National Comprehensive Cancer Network. Prevention and Treatment of Cancer-Related Infections. NCCN. Available at http://www.nccn.org/professionals/physician_gls/pdf/infections.pdf. Version 1.2018 — December 1, 2017; Accessed: September 18, 2018. Kern WV, Cometta A, De Bock R, Langenaeken J, Paesmans M, Gaya H. Oral versus intravenous empirical antimicrobial therapy for fever in patients with granulocytopenia who are receiving cancer chemotherapy. International Antimicrobial Therapy Cooperative Group of the European Organization for Research and Treatment of Cancer. N Engl J Med. 1999 Jul 29. 341(5):312-8. [Medline]. Bow EJ, Mandell LA, Louie TJ, Feld R, Palmer M, Zee B, et al. Quinolone-based antibacterial chemoprophylaxis in neutropenic patients: effect of augmented gram-positive activity on infectious morbidity. National Cancer Institute of Canada Clinical Trials Group. Ann Intern Med. 1996 Aug 1. 125(3):183-90. [Medline]. Freifeld A, Marchigiani D, Walsh T, Chanock S, Lewis L, Hiemenz J, et al. A double-blind comparison of empirical oral and intravenous antibiotic therapy for low-risk febrile patients with neutropenia during cancer chemotherapy. N Engl J Med. 1999 Jul 29. 341(5):305-11. [Medline]. Formiga F, Mitjavila F, Pac M, Moga I. Effective splenectomy in agranulocytosis associated with systemic lupus erythematosus. J Rheumatol. 1997 Jan. 24(1):234-5. [Medline]. Palmblad J, Nilsson CC, Höglund P, Papadaki HA. How we diagnose and treat neutropenia in adults. Expert Rev Hematol. 2016 Feb 16. Vol 2:1-9. [Medline]. Haddy TB, Rana SR, Castro O. Benign ethnic neutropenia: what is a normal absolute neutrophil count?. J Lab Clin Med. 1999 Jan. 133(1):15-22. [Medline]. Rodriguez A, Yood RA, Condon TJ, Foster CS. Recurrent uveitis in a patient with adult onset cyclic neutropenia associated with increased large granular lymphocytes. Br J Ophthalmol. 1997 May. 81(5):415. [Medline]. [Full Text]. Bar-Joseph G, Halberthal M, Sweed Y, Bialik V, Shoshani O, Etzioni A. Clostridium septicum infection in children with cyclic neutropenia. J Pediatr. 1997 Aug. 131(2):317-9. [Medline]. Boxer LA. Immune neutropenias. Clinical and biological implications. Am J Pediatr Hematol Oncol. 1981 Spring. 3(1):89-96. [Medline]. Welte K, Dale D. Pathophysiology and treatment of severe chronic neutropenia. Ann Hematol. 1996 Apr. 72(4):158-65. [Medline]. Young NS. Agranulocytosis. JAMA. 1994 Mar 23-30. 271(12):935-8. [Medline]. Berliner N, Horwitz M, Loughran TP Jr. Congenital and acquired neutropenia. Hematology Am Soc Hematol Educ Program. 2004. 63-79. [Medline]. D'Angelo G. Ethnic and genetic causes of neutropenia: clinical and therapeutic implications. Lab Hematol. 2009. 15(3):25-9. [Medline]. Bohlius J, Herbst C, Reiser M, Schwarzer G, Engert A. Granulopoiesis-stimulating factors to prevent adverse effects in the treatment of malignant lymphoma. Cochrane Database Syst Rev. 2008 Oct 8. CD003189. [Medline]. D'Souza A, Jaiyesimi I, Trainor L, Venuturumili P. Granulocyte colony-stimulating factor administration: adverse events. Transfus Med Rev. 2008 Oct. 22(4):280-90. [Medline]. Kelly S, Wheatley D. Prevention of febrile neutropenia: use of granulocyte colony-stimulating factors. Br J Cancer. 2009 Sep. 101 Suppl 1:S6-10. [Medline]. [Full Text]. Carlsson G, Aprikyan AA, Ericson KG, Stein S, Makaryan V, Dale DC, et al. Neutrophil elastase and granulocyte colony-stimulating factor receptor mutation analyses and leukemia evolution in severe congenital neutropenia patients belonging to the original Kostmann family in northern Sweden. Haematologica. 2006 May. 91(5):589-95. [Medline]. Xia J, Bolyard AA, Rodger E, Stein S, Aprikyan AA, Dale DC, et al. Prevalence of mutations in ELANE, GFI1, HAX1, SBDS, WAS and G6PC3 in patients with severe congenital neutropenia. Br J Haematol. 2009 Nov. 147(4):535-42. [Medline]. [Full Text]. Goulenok T, Fantin B. Antimicrobial Treatment of Febrile Neutropenia: Pharmacokinetic-Pharmacodynamic Considerations. Clin Pharmacokinet. 2013 Jun 27. [Medline]. Andersen CL, Tesfa D, Siersma VD, Sandholdt H, Hasselbalch H, Bjerrum OW, et al. Prevalence and clinical significance of neutropenia discovered in routine complete blood cell counts: a longitudinal study. J Intern Med. 2016 Jan 21. [Medline]. Mueller EL, Croop J, Carroll AE. Fever and neutropenia hospital discharges in children with cancer: A 2012 update. Pediatr Hematol Oncol. 2016 Feb 22. 1-10. [Medline]. Grann VR, Bowman N, Joseph C, Wei Y, Horwitz MS, Jacobson JS, et al. Neutropenia in 6 ethnic groups from the Caribbean and the U.S. Cancer. 2008 Aug 15. 113(4):854-60. [Medline]. Cullen M, Baijal S. Prevention of febrile neutropenia: use of prophylactic antibiotics. Br J Cancer. 2009 Sep. 101 Suppl 1:S11-4. [Medline]. [Full Text]. Krell D, Jones AL. Impact of effective prevention and management of febrile neutropenia. Br J Cancer. 2009 Sep. 101 Suppl 1:S23-6. [Medline]. [Full Text]. Pathak R, Giri S, Aryal MR, Karmacharya P, Bhatt VR, Martin MG. Mortality, length of stay, and health care costs of febrile neutropenia-related hospitalizations among patients with breast cancer in the United States. Support Care Cancer. 2015 Jan 4. [Medline]. Meisel A, von Felten S, Vogt DR, Liewen H, de Wit R, de Bono J, et al. Severe neutropenia during cabazitaxel treatment is associated with survival benefit in men with metastatic castration-resistant prostate cancer (mCRPC): A post-hoc analysis of the TROPIC phase III trial. Eur J Cancer. 2016 Jan 29. 56:93-100. [Medline]. Jansen RR, Biemond BJ, Schinkel J, Koekkoek SM, Molenkamp R, de Jong MD, et al. Febrile neutropenia: significance of elaborated screening for respiratory viruses, and the comparison of different sampling methods, in neutropenic patients with hematological malignancies. Virol J. 2013 Jun 27. 10(1):212. [Medline]. Hellmich B, Schnabel A, Gross WL. Treatment of severe neutropenia due to Felty's syndrome or systemic lupus erythematosus with granulocyte colony-stimulating factor. Semin Arthritis Rheum. 1999 Oct. 29(2):82-99. [Medline]. MacVittie TJ. Therapy of radiation injury. Stem Cells. 1997. 15 Suppl 2:263-8. [Medline]. Mac Manus M, Lamborn K, Khan W, Varghese A, Graef L, Knox S. Radiotherapy-associated neutropenia and thrombocytopenia: analysis of risk factors and development of a predictive model. Blood. 1997 Apr 1. 89(7):2303-10. [Medline]. [Guideline] National Comprehensive Cancer Network. NCCN Clinical Practice Guidelines in Oncology, Myeloid Growth Factors. Available at http://www.nccn.org/professionals/physician_gls/PDF/myeloid_growth.pdf. Version 2.2018 — August 03, 2018; Accessed: September 17, 2018. [Guideline] Smith TJ, Bohlke K, Lyman GH, Carson KR, Crawford J, Cross SJ, et al. Recommendations for the Use of WBC Growth Factors: American Society of Clinical Oncology Clinical Practice Guideline Update. J Clin Oncol. 2015 Oct 1. 33 (28):3199-212. [Medline]. [Full Text]. [Guideline] Aapro MS, Bohlius J, Cameron DA, Dal Lago L, Donnelly JP, Kearney N, et al. 2010 update of EORTC guidelines for the use of granulocyte-colony stimulating factor to reduce the incidence of chemotherapy-induced febrile neutropenia in adult patients with lymphoproliferative disorders and solid tumours. Eur J Cancer. 2011 Jan. 47 (1):8-32. [Medline]. Wang XJ, Tang T, Farid M, Quek R, Tao M, Lim ST, et al. Routine Primary Prophylaxis for Febrile Neutropenia with Biosimilar Granulocyte Colony-Stimulating Factor (Nivestim) or Pegfilgrastim Is Cost Effective in Non-Hodgkin Lymphoma Patients undergoing Curative-Intent R-CHOP Chemotherapy. PLoS One. 2016. 11 (2):e0148901. [Medline]. Massey E, Paulus U, Doree C, Stanworth S. Granulocyte transfusions for preventing infections in patients with neutropenia or neutrophil dysfunction. Cochrane Database Syst Rev. 2009 Jan 21. CD005341. [Medline]. Dranitsaris G, Rayson D, Vincent M, Chang J, Gelmon K, Sandor D, et al. Identifying patients at high risk for neutropenic complications during chemotherapy for metastatic breast cancer with doxorubicin or pegylated liposomal doxorubicin: the development of a prediction model. Am J Clin Oncol. 2008 Aug. 31(4):369-74. [Medline]. Blackwell K, Semiglazov V, Krasnozhon D, Davidenko I, Nelyubina L, Nakov R, et al. Comparison of EP2006, a filgrastim biosimilar, to the reference: a phase III, randomized, double-blind clinical study in the prevention of severe neutropenia in patients with breast cancer receiving myelosuppressive chemotherapy. Ann Oncol. 2015 Sep. 26 (9):1948-53. [Medline]. [Full Text]. Walsh TJ, Finberg RW, Arndt C, Hiemenz J, Schwartz C, Bodensteiner D, et al. Liposomal amphotericin B for empirical therapy in patients with persistent fever and neutropenia. National Institute of Allergy and Infectious Diseases Mycoses Study Group. N Engl J Med. 1999 Mar 11. 340(10):764-71. [Medline]. Curnutte J, Coates T. Disorder of phagocyte function and number. In: Hoffman R, Benz EJ Jr, Shattil SJ, et al, eds. Hematology: Basic Principles and Practice. 3rd ed. New York, NY: Churchill Livingstone; 2000. 720-62. Douglas D. Antifungals cut risk of invasive infections in neutropenic patients. Reuters Health Information. September 9, 2013. [Full Text]. Pechlivanoglou P, Le HH, Daenen S, Snowden JA, Postma MJ. Mixed treatment comparison of prophylaxis against invasive fungal infections in neutropenic patients receiving therapy for haematological malignancies: a systematic review. J Antimicrob Chemother. 2013 Aug 23. [Medline]. Chustecka Z. Biosimilar Filgrastim Recommended for Approval in US. Medscape Medical News. January 7, 2015. Available at http://www.medscape.com/viewarticle/837725. The margins of this massive spleen were palpated easily preoperatively. Medially, the 3.18-kg (7-lb) spleen crosses the midline. Inferiorly, it extends into the pelvis. Doppler sonogram at the splenic hilum reveals hepatofugal venous flow in a patient with portal hypertension.